That’s right, I’m back from Vancouver Island and although I had a very unproductive start to the day as I indulged in sleeping in, I eventually got up and started work on two more test models. Why am I still painting test models when Astronomi-con Vancouver is like two weeks away? Well I want to get my red and purple painting down pretty tight as I’m going to do some expensive resin models and I hope that by getting the kinks worked out on plainer janer models I can paint the special models quicky and efficiently. I still plan to try and get the Chaos Sorcerer done by this Sunday for the Warhammer Campaign at Strategies. I’m not even last, as more people have joined and they are winless but have played less games than me. 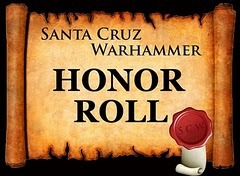 Hopefully the sorcerer and the 3 Beast of Nurgle will make a difference as so far I’ve not been very competative. I’ve also agreed to paint yet more square based models for the Vancouver Gamers Warhammer 8th Edition builder challenge. I’m actually winning that as I painted so many goblins and I have so many more that are close to being finished. I just need to base them, do some touch ups, paint shields etc. I also need to do war machine crew. I had hoped post-Astronomi-con to try and clean off my painting table for the first time in years, but I realized I’m going to have to keep painting goblins in addition to the other stuff I have already primed and ready to be painted. I’ve put a lot of thought into my Orks and Goblins (mostly Goblins) army. I still don’t think it is very competitive at low points, as most of my points are common goblins and a few goblin heroes and war machines. I think at 2000 or 2500 points I will have some ork infantry as well as some harder hitting units though I’m not sure which ones. I’d like to do up a lot of things just to try them out but money and time will keep me painting the models I already own. One of which is a very old Grom the Paunch chariot model. 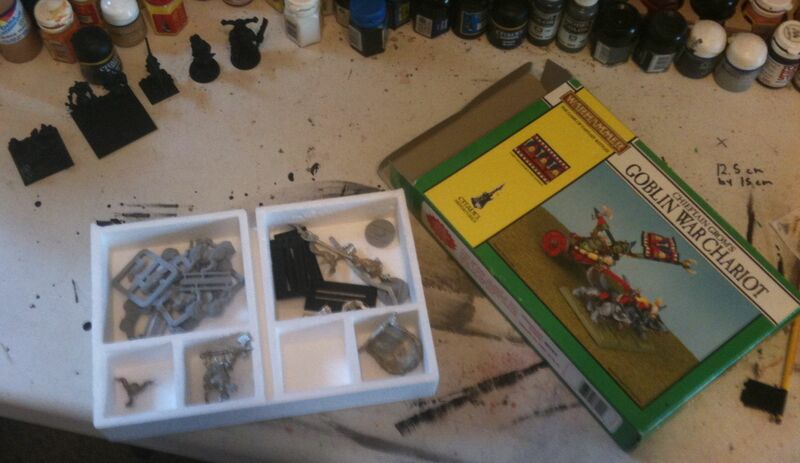 The shrink wrap is off but the model has never really left the box, Grom is still slightly discolored. The 2nd Test Bezerker first had the metal trim done, as that is what I did last time. It is just Tin Bitz then Brazen Brass highlight than thinned down Rust Brown Ink used as a glaze to colour the highlights as well as blend them in. I happened upon this combo and have been using it for years, I don’t think many people do metallics like this. The red was a lot of work, too much work for rank and file models. I’ll simplify the recipe post-Astronomi-con. I used two of the three dark red Reaper Master Series paints I bought. 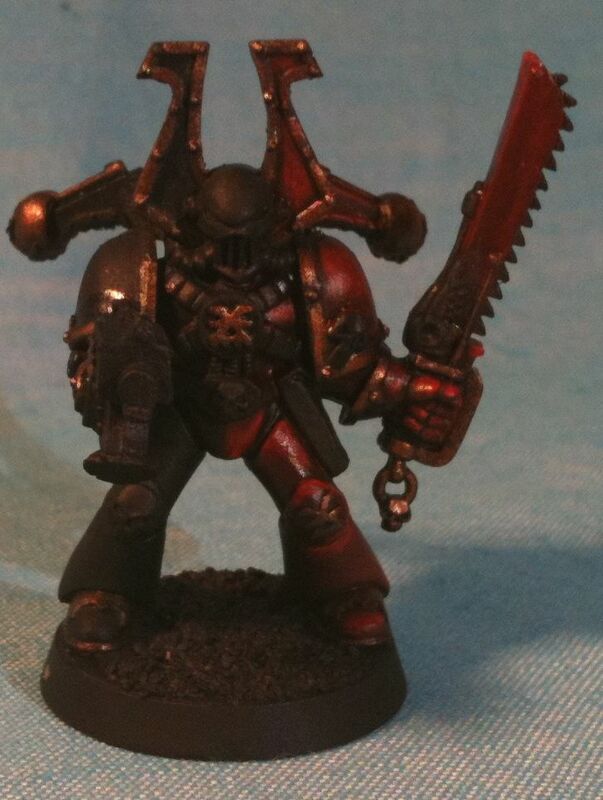 First Bloodstain Red then Clotted Red then a custom wash made from Plasma Red Ink and Shadow Black Ink both of these are very old GW/Citadel branded products. Then when this was dry I did Clotted Red again followed by an extremely old pot of Go Fasta Red. I then used an old Red Gore but that was a mistake as that paint has gotten difficult to work with, so I had to paint offer some highlights with darker reds and build back up, this thickened the paint considerably on the groin plate. After one coat of that I think I did another wash of my custom black/red wash. 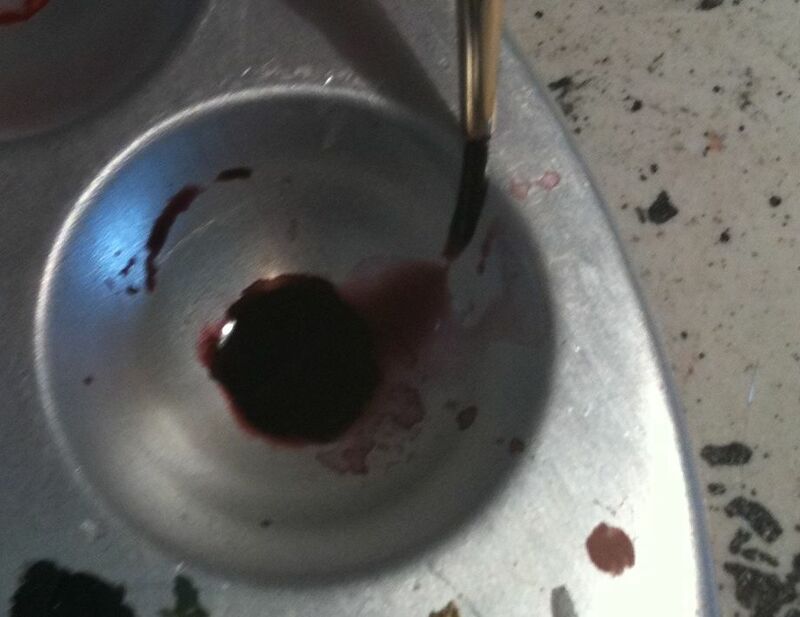 When that was dry I used my new pot of Blood Red. After that I used a fairly old pot of GW Red Glaze. The plan is to keep building up the highlights with Blood Red and Red Glaze until I get tired or get it looking pretty good. I don’t intend to go up to orange let alone yellow. I want a dark and evil looking red. 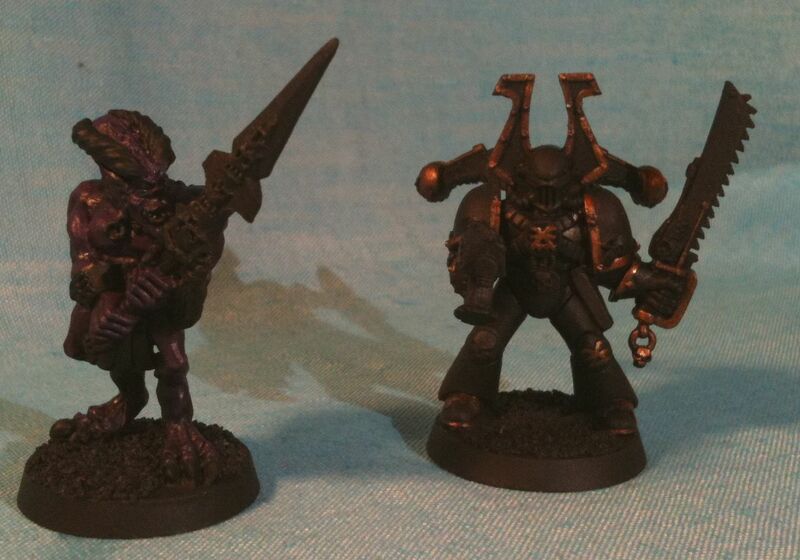 The old out of print Bloodletter is serving as a test model for a bigger daemon. I don’t want stereotypical red daemons so I’m trying purple. This is after one coat of GW’s darkest purple, Liche I think it is called. This is one of my favourite colours in GW’s paint line. I plan to paint another layer of this and then a wash, not the new GW wash either, I’m sticking with the old one suitably thinned, though I might even add a touch of black to it. Then I plan to highlight with the Foundry Royal Purple Triad and after that I may do the highlight up even more, throw in some glazes too. 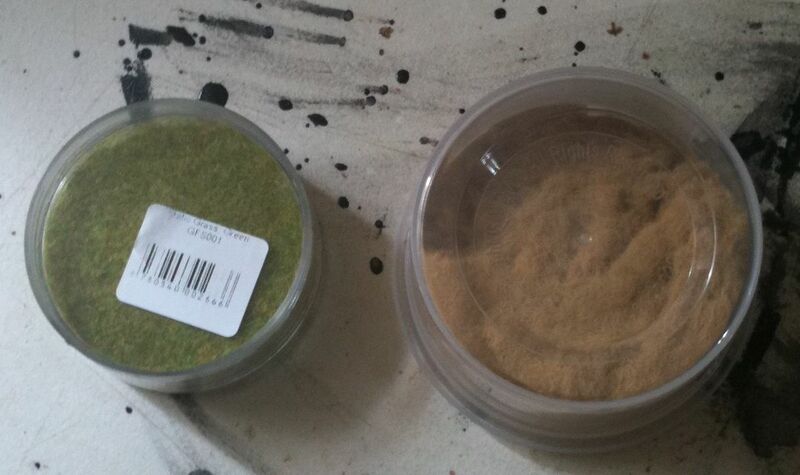 Oh and I’ve bought more basing materials which I plan to test out post-Astronomi-con on some of my many, many goblins.